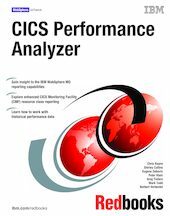 This IBM® Redbooks® publication targets CICS® Transaction Server V1.3 and V2.2 customers who plan to implement IBM CICS Performance Analyzer. This tool allows you to produce a wide range of reports and extracts to help you tune and manage CICS systems. The first part of this book begins with an overview of CICS-provided tools and utilities that help you gather and analyze performance data. Then it introduces the CICS Performance Analyzer product and its various report generating options. It also shows you how to import the extracted performance data into spreadsheets for further analysis. The second part of this book takes you through a series of scenarios that cover major CICS components and interfaces. These include CICS-VSAM interface, CICS-DB2® Attachment Facility, CICS use of the MVS™ System Logger, Java™ applications in CICS, and others. For each scenario, you see how you can extract the relevant performance data using CICS Performance Analyzer. You can then use this data to improve the overall system performance or to compare different execution options at run time. This Redbooks publication explores the new functionality of CICS PA Release 1.3, including IBM WebSphere MQ and how CICS PA now handles System Management Facility (SMF) 116 records. It looks at the new CICS Monitoring Facility (CMF) reports such as the Wait Analysis and Temporary Storage Usage reports. It aslo explains the Historical Database (HDB) facility for maintaining a history of CMF performance data for longer term reporting or exporting to DB2.